Pensacola, Fla. (April 6, 2018) – The newly renovated Infusion Center at the Baptist Cancer Institute is now open. In January 2016, the Baptist Health Care Foundation received a $100,000 contribution from Quint and Rishy Studer. 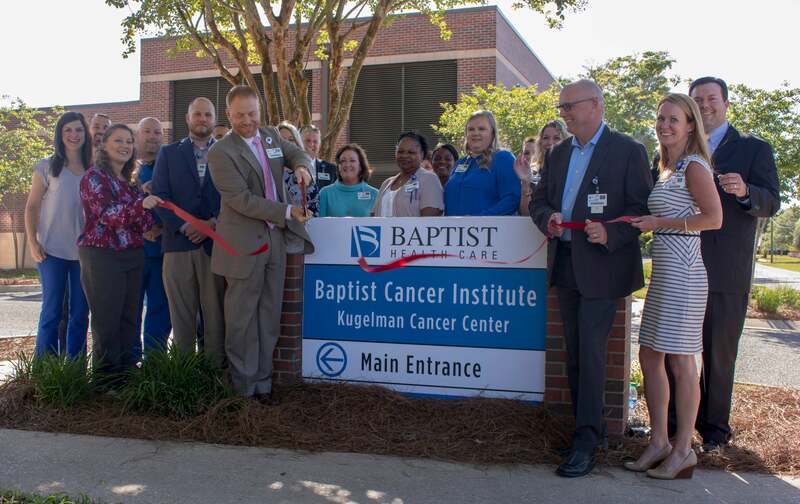 The gift, along with proceeds from the Baptist Health Care Foundation Stepping Out In Style fundraiser, was used to expand the Infusion Center to more conveniently serve patients. "We are thrilled to be able to support the renovation and expansion of Baptist's Infusion Center,” says Rishy Studer. “It is our hope that the new infusion center will help make a very difficult time in a patient and family’s life a bit more private and comfortable." The Baptist Infusion Center facilitates infusion services for a wide variety of specialties other than oncology chemotherapy (i.e., cardiology, antibiotic, rheumatology, osteoporosis and gastrointestinal). The project helped to separate chemotherapy infusions, allowing for more space and convenience in patient treatment areas. The Studer’s contribution provided furniture, fixtures and equipment for the new area located on the ground floor of Baptist Medical Tower 3. New infusion chairs, an additional family member chair and a TV for each chemotherapy treatment bay, along with individual adjustable accent lighting for each bay were purchased in order to provide a comforting and peaceful experience for patients and their family members. The newly renovated Infusion Center also includes a pharmacy to support the education of patients and staff as well as improve the overall safety and quality of the experience. Baptist Health Care is a community-owned, not-for-profit health care organization committed to improving the quality of life for people and communities in Northwest Florida and South Alabama. The organization is a proud member of the Mayo Clinic Care Network. A 2003 Malcolm Baldrige recipient, Baptist continuously strives to be a national leader in quality and service. Baptist Health Care includes three hospitals, four medical parks, Andrews Institute for Orthopaedic & Sports Medicine, Lakeview Center, Baptist Medical Group and Cardiology Consultants. With more than 6,500 employees and employed physicians, Baptist Health Care is the largest non-governmental employer in northwest Florida. For more information, please visit www.eBaptistHealthCare.org.